Is it true that we should drink 8 glasses of water daily? Some articles said that we should drink 8 glasses of water daily to keep our body healthy. Others said that we should drink water whenever our body alarmed us to drink as like thirsty feeling. So we need not to drink 8 water glasses a day. So which one is true? For me, its more reasonable to drink water whenever our body need it than should drink 8 glasses water daily. It will make my stomach feeling full. What do you think? Yes we should drink 8 glasses of water every day. Sometimes when a person feels that they are hungery they really are thristy. I can tell when I haven't had enough water when my lips get dry. 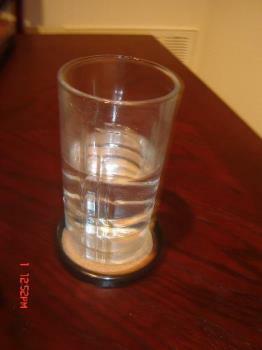 I spread out the glasses of water and only drink 1/2 glass at a time. You can tell if you are not drinking enought water by the color of your urin. It should be almost clear. When it is yellow you are not getting enough water. Juice and soups do not count as water. Drinking caffeinated or sugary drinks such as coffee, tea, fruit drinks or soda also causes water loss. So you need to drink a lot more water. but how to overcome the full feeling in stomach? You drink 1/2 glass at a time or sip the water like you would soda or coffee and tea. don't try to drink a full glass all at once. Actually water make up more than two thirds of the weight of human body and without it humans would day in few days.Did you know human brain is made up from 95% of water, blood of 82% and lungs 90%.When we don't drink enough, we can feel dizzy, has a trouble with simple math, fuzzy shor=term memory....Do you have trouble reading this?Drink-up.And that what you write about drinking when our body get thirsty is not true.It is big mistake what a lot people are doing, they drink only if they are thirsty.But when our body give to our brain that information we are thisrty it means we are already little dehydrated.I am one of the person who is very rare thirsty(and I know many people like that)It would be enough for me to drink two glasses of water.And yeah i did this sometimes, when I foreget to drink, but then I just realize, I cannot eat, do nothing, i am tired, becuase my money want water. Hello, Plumwish! you are absolutely right. i have seen some where written that a minimum of two liters of water is required by our body in normal situation.it may go up,however, during summer season.you may feel thirsty,but then you have to drink water at regular intervals.thank you.keep on. Water keeps your skin in good condition. In the process of sweating, it also removes impurities in the skin and cleanses it - leaving you with a healthy and younger looking skin. Dehydrated skin cells can cause your skin to appear wrinkled or sagging. Water does not contain calories. Water suppresses appetite. Water minimizes the risk of heart disease. Increased blood pressure is a sign of a heart that’s working harder than it should - it tries to pump more blood to excretory organs to compensate for the reduced volume. This could probably worsen a heart related ailment. Sufficient water intake will ensure that this does not happen.Water circulates through the blood and helps transport nutrients and oxygen towards organs and cells.It acts as a solvent for many nutrients and essential salts and makes them available for absorption by the body. It also serves as a medium to carry metabolic wastes away from the body - this is accomplished in the form of urine and sweat. Think of it as a detoxifying agent. Water helps reduce the risk of kidney stones. Water helps reduce the risk of sunstroke. On sunny days, we sweat (in other words - excrete water) more and the evaporation of the sweat has a cooling effect on the body. Inthe absence of sufficient water (when dehydration occurs) in your body, this temperature regulation breaks down and body temperature increases - and this leads to sunstroke. so, still need to drink 8 glasses daily or just if we need to drink? dont drink too much. ur lungs will be filled with water and u drown! just drink when needed! I notice that you are concered with how to drink 8 glasses of water in one day without making your stomache feeling full.Why you have this problem?You drink muchwater very time but you drink few times per-day?Why not drink more often rather than drink more water at one time? I believe in the 8 glasses (or more) a day. It's really healthy and it's a good way to cleanse our body. It also helps us from getting UTI and Kidney problems. When I had this urinary track infection, my doctor asked me to take 3 liters a day of water. She asked me to maintain it as much as possible. I do not usually take this much of water, nor complete the 8 glasses a day requirement. I thought I cannot take that much. But taking the 3 liters requirement, I feel clean and my skin is not dry. yes,of course !! i keep on doing it everyday !! Well In Summers;it is good to drink 8 glasses of water. But not too sure about Winters ! I still little bit confused about this thing. In a book I've read, it doesn't really necesary to drink 8 glass of water a day. Just drink when you feel thirsty, but of course people there will none of people drink just drink one glass of water a day. I even read in one magazine that drinking 8 glass of water in one day were included as "stupid rule even smart girl follow" But, my auntie has diabetes and her doctor told her that one of her medicine is 8 glass of water a day. Even more I guess, but it did help her a lot to balanced the sugar in her body. It hasn't been an exciting experience for the first time, but she said your body will get used to it. She even said that her body feel lighter than before, not skinnier but lighter. She and I don't know technically how it works, but it help her. But as it for me..until today I never count how many glasses of water I had in one day..
Not exactly 8 but may vary from person to person. But I feel, intake should be as much as we feel it comfortable. Recently I had visited a doctor and asked the same question.He answered--- Look Mr..... Urine is a good indicator of our health.Urine colour indicates it.If your urine colour is much similar to your intake water(Close to colourless) then your drinking sufficent water. Is it OK ? I think it's much more beneficial for us to drink more water everyday. Sometimes when I am busy at work, I will forget about it. So I got a good idea. I use a very big glass now and therefore everytime I make sure I will drink enough water. Water is the best drink and I already try to get rid of soda water etc. Drinking water does fill you up, warm water will stop you from feeling hungry & most of the time when you are hungry it is your body trying to tell you it needs water. I drink about 2ltrs of water every day....not including tea ect. I fill my water bottle every morning & mae sure I have had it all by the time I go to bed. By the time you are thirsty your body is already dehydrated. I don't think so. I heard that we haven't drink too much. 4-6 glasses maybe enough. about 8 glasses? it's just a drinking water product commercial. Drink them at various times of the day. Some in the morning. Some in the afternoon. Some in evening. Some before bed. If you can't do that, drink what you can. Don't get dehydrated though. Oh and don't force 8 glasses of water down you at the end of the day. It just doesn't work like that.